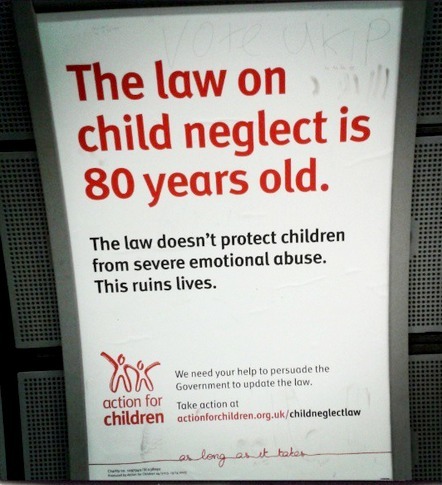 A couple of weeks back I was stopped in my tracks – or by the tracks – as I read a very simple tube platform poster about Action For Children’s campaign to update the 80 year old law on child neglect. I was on my way to pick up my daughter from her lovely little Montessori nursery after having been at a meeting with Education Minister Elizabeth Truss, Jen and Susanna from BritMums and fellow BritMums bloggers GlossWitch and Musings From A Mum. We’d been discussing the government’s recent proposals on childcare. The juxtaposition of a bunch of middle class mums discussing childcare issues against the issue of basic levels of care and support for many children in this country hit me hard. So, I set to work with a Silent Sunday image of the poster and a post on the Action For Children campaign. 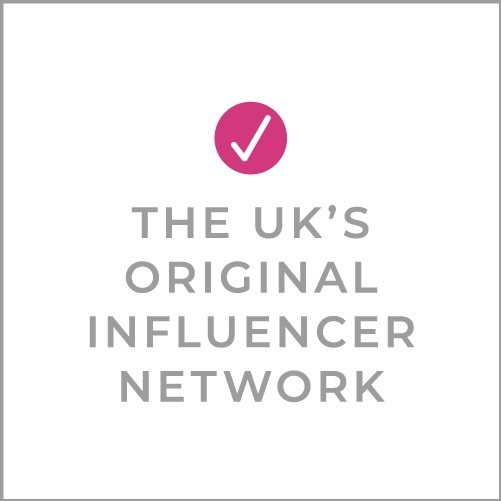 And now I am trying to spread the word further by way of the wonderful BritMums Blog to a community of fellow parent bloggers who I know will care as much as I do once they are aware of the issue. 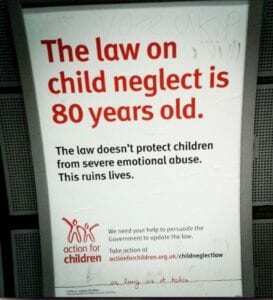 Child neglect is the most common form of child abuse in the UK. As many as 1.5 million children are believed to be neglected in some way and it is the most common reason for child protection referral. The 80-year-old law, called the Children and Young Person’s Act 1033, is outdated and does not cover emotional neglect, which is now known to be hugely damaging to children’s development. It also causes real confusion and difficulties for police and social workers who need to work together to protect neglected children. Action for Children has 140 years of experience on this issue and is campaigning to improve the way child neglect is tackled by campaigning to have the 80-year-old law on child neglect updated and made fit for purpose in the 21st century. You can read about the charity’s work on child neglect and its most recent review of child neglect, The State Of Child Neglect In The UK on its website. The charity is asking parents to take two minutes to write to their MPs asking them to update the law on child neglect. The charity has made it easy to do this by creating a simple Change Neglect Law email template on its website. If you want to help spread the word please share this post through your social media channels or write your own post. You can find a press release outlining the campaign here. You can also support Action For Children in its campaign by making a donation to the charity. Thank you for reading this post. There are thousands upon thousands of children who could benefit from your support in helping push for the law on child neglect to be updated and made fit for purpose in the 21st century. Luci McQuitty Hindmarsh is a mother, wife and writer- in that order. Honest. She is based in London and started her career in journalism before accidentally languishing in PR for too many years – it was the lashings of champagne wot done it. Motherhood allowed her to change track and get back to what she loves – writing. Luci can regularly be found loitering with intent on Twitter as @motherwifeme and @mapucebilingual and also ventures onto Facebook.